← Martha Hodes podcast–coming soon! 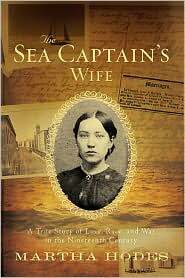 This episode of Making History Podcast features historian Martha Hodes reading excerpts from her book The Sea Captain’s Wife: A True Story of Love, Race, and War in the Nineteenth Century . Following her reading, Martha discusses various stylistic choices she made in writing the narrative of Eunice’s life. Of particular interest are her thoughts about telling a “true” story. What part of this reading resonates most strongly with you? How do you feel about Martha’s discussion of the choices she made in quoting from Eunice’s letters? In what ways does telling the story of a remarkable figure like Eunice–a woman who married across the color line– help us to better understand the lives of other women in the nineteenth century? Will Martha’s example impact your own history writing? If so, how? Note: click here to listen to this episode of Making History Podcast or subscribe to the feed for MH podcast. Next Monday Part 2 of this podcast will be posted. Stay Tuned! This entry was posted in books, history, podcast, writing and tagged Martha Hodes, nineteenth century, podcast, women's history, writing. Bookmark the permalink.